~TIAW on Tumblr, Pinterest and Facebook. ~SOAM on Twitter, Facebook, Instagram, and YouTube. ~Join in on our weekly photo project. ~Participate in our very special, collaborative ten-year anniversary video! ~Join our mailing list for the best way to keep up to date! ~Good morning, have some snarky feminist commentary that will give you the giggles. ~Love this beautiful photo series of working moms. <3 ~John Oliver on International Women’s Day last week. If you haven’t seen this yet, it’s golden. ~And don’t forget to check out the Mid Drift Kickstarter. They’re already almost halfway with more than half the month to go! See something that belongs in the Feminist Fridays? 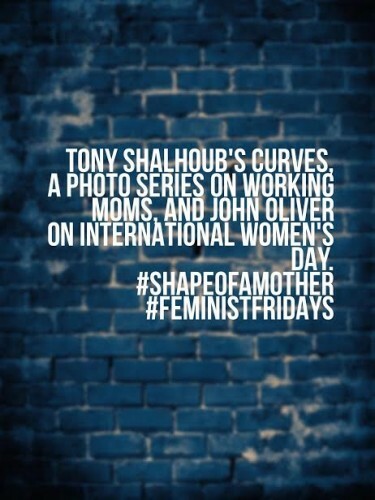 send it to me either at my email address (theshapeofamother@gmail.com) or over on the Facebook page.